3.5/5 stars.After reading Monument 14 last year, I was looking forward to seeing how the series would continue, considering the very open ending. Thankfully, Sky on Fire picks up right where the first book left off, with two different journeys taking place via alternating viewpoints. 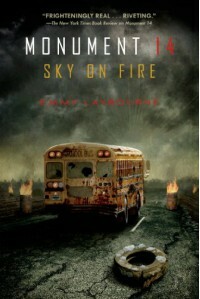 Whereas Monument 14 was a bit of a light post-apocalyptic read, considering the confined environment that the kids are living in, Sky on Fire is much darker, more gritty and doesn't shy away from the fallout of the explosion at the plant that's released chemical warfare compounds into the air. While I'm not necessarily one for horror in any aspect, I did appreciate the fact that Ms. Laybourne didn't shy away from her descriptions of the horrors the kids face. All of their experiences really helped ground the book and kept me eagerly turning the pages.My one complaint about this book is that, despite the fact that it is compulsively readable and really grabs hold of the reader, the way the book is written comes across as stilted in many parts. I especially noticed that there seemed to be several instances where things were explained when elaboration really wasn't necessary. I don't know if that was simply to remind the readers that the narrators are themselves quite young, or what, but I personally found it unnecessary and a bit like the author was talking down to whomever was reading.I also never really emotionally connected with either of the people telling the story. While the book is definitely gripping - I read it all the way through in one sitting - it didn't impact me on an emotional level like I was hoping it would, aside from a vague desire to have everyone reunited with their loved ones. Now, this might be because the last book I read literally punched me in the gut and not through any flaw of Sky on Fire itself, so do take that with a grain of salt. Obviously, your mileage may vary!Ultimately I think that, if you liked Monument 14, you will likewise enjoy Sky on Fire. It is definitely a solid continuation of the series, where things are ratcheted up and the danger and suspense are much more ever-present. Based on the ending, it looks like there might be a third book in the works; should Ms. Laybourne write one, I will certainly give it a read!An e-galley was provided by the publisher via NetGalley in exchange for an honest review. 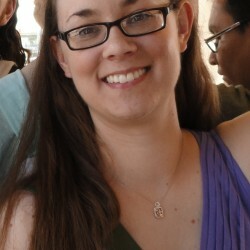 ***To see more of my reviews, please visit me @ Read and Reviewed!